The Library makes available below, in chronological order, various publications of interest to ringing historians and collectors of ringing books. Copyright of the images is held by the CCCBR but they may be downloaded for personal use. Clicking on a reference will open the document in a new browser window or tab. The Libary Steward would welcome comments on what is available and possible future developments. The indexes to Campanology and The Bellringer now have a point-and-click facility, thanks to Tony Smith. John Carr (1799-1873) learned to ring at Waltham Abbey in Essex. He made something of a reputation for himself in London and the eastern counties by performing handbell touches of Oxford Treble Bob and Grandsire Triples four-in-hand, with his brother, William, ringing the other four bells. Though John spent most of his life in Waltham Abbey, he moved to Cambridge in 1843 and lived and rang there for just over four years. During that time he wrote and published a short pamphlet that described both the ringing expeditions he made around East Anglia and notable events from his earlier life. 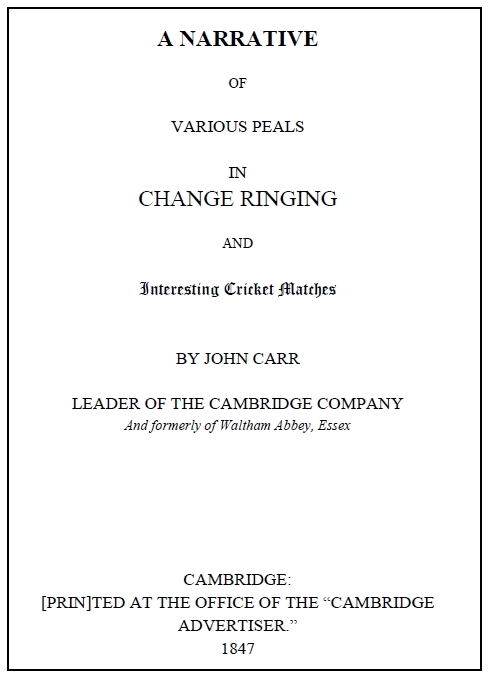 In addition to his bellringing interests, Carr was an enthusiastic and competent cricketer and some of these successes are also described in A Narrative of Various Peals in Change Ringing and Interesting Cricket Matches. This transcription is the work of Liam Sims, Rare Books Specialist, Cambridge University Library from the unique copy in Cambridge University Library, shelfmark 1871.7.1093. Liam unearthed the pamphlet at the request of John Eisel, who has formatted this version of the transcription to closely match the layout of the original. A bound copy of the transcription is also held in the CCCBR library. 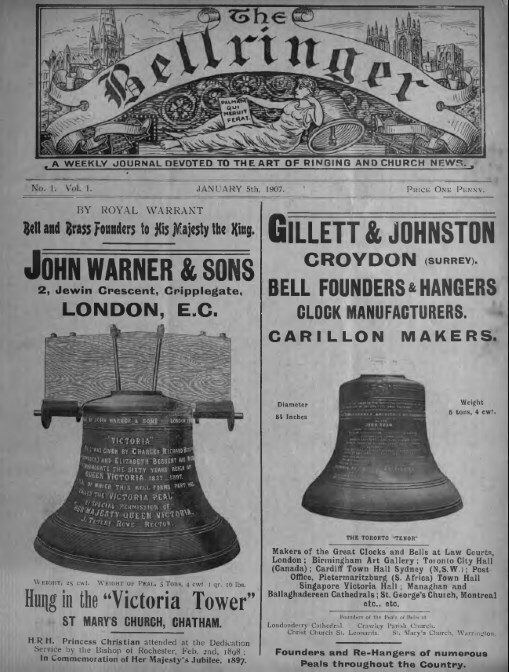 Church Bells was a weekly paper for church folk, published towards the end of Victoria’s reign. The first edition appeared on New Year’s Eve, 1870 and it came out regularly until August 25th 1906. 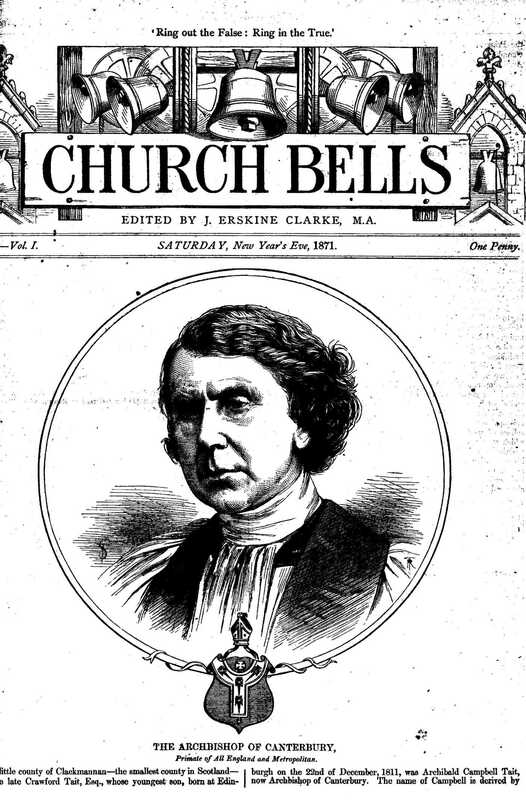 The paper began with Reverend John Erskine Clarke (1827 – 1920) as proprietor and editor. 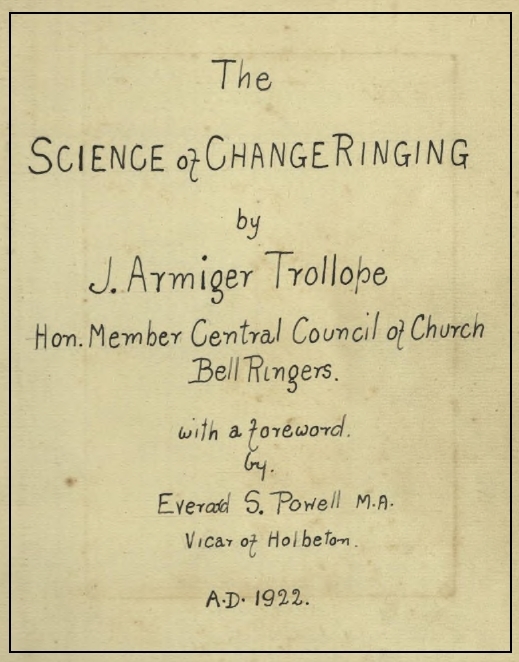 From the very beginning the contents included a column on bells and bell-ringing under the direction of Revd H T Ellacombe. This proved successful and the column was extended to a full page and included contributions by many of the leading ringers of the time. Only one issue out of 1861 did not contain the news of bells and bell-ringing. The section remained under the nominal control of Ellacombe until his death in 1885, but Ellacombe’s remoteness from the main centres of change-ringing led Erskine Clarke, in about 1878, to invite Harvey Reeves to look after it. When Reeves moved on to start The Bell News and Ringers’ Record in February 1881, he was succeeded by James Robert Haworth, who continued to edit the page until about 1895. In 2014 the John Taylor Bellfoundry Museum (and the Board of Bell Foundry Collections Ltd) kindly lent their almost complete set of Church Bells to the CCCBR Library to allow all the material relating to bells and bell-ringing to be scanned and made available online. Making it possible for the scans to be made while the volumes were disbound greatly assisted the undertaking of the project and helped to ensure the best possible quality of the images. The assistance of The Bodleian Libraries, The University of Oxford, is acknowledged for the provision of scans of the following pages: Shelfmark: N.1126 c.13. Vol.22, Issue No.1093 (4th December 1891) pp.16,18; Issue No.1094 (11th December 1891) pp.37,38,40; Issue No.1095 (18th December 1891) p.62; Issue No.1096 (24th December 1891) pp.80,82. Vol.24, Issue No.1201 (29th December 1893) pp.80,81; Issue No.1224 (8th June 1894) p.518; Issue No.1239 (21st September 1894) p.824. Vol.25, Issue No.1260 (15th February 1895) pp.225,226. Vol.30, Issue No.1514 (29th December 1899) pp.122,124. Vol.31, Issue No.1566 (28th December 1900) pp.99,100. Vol.35, Issue No.1788 (31st March 1905), p.376. 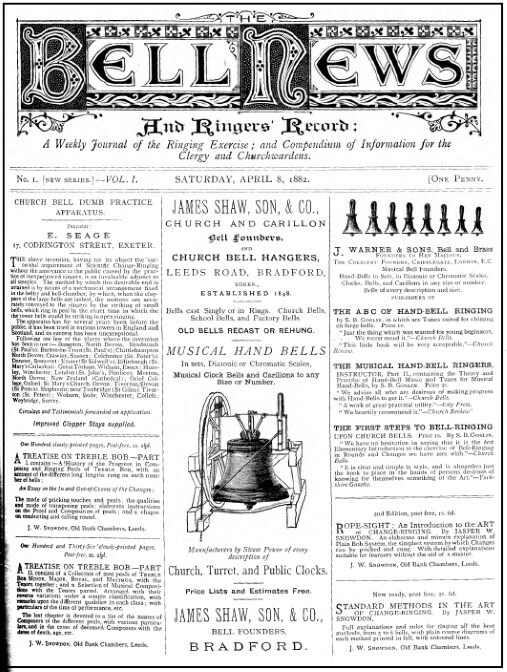 Bell News was the first journal solely devoted to ringing. It appeared monthly from February 1881 until April 1882 and then weekly until 25 December 1915. All issues can be accessed below. Note that when using the index, which uses ‘Year/Page No’ references, some references can occur in two volumes. For example ’83/317′ to ’83/420′ occur in both Volume 1 and Volume 2. Bell News is also available on DVD on application. 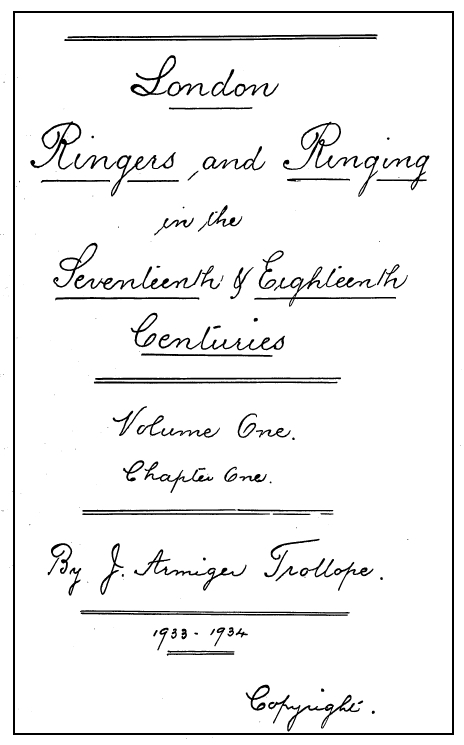 The Library is grateful for the permission to use the comprehensive index compiled by the late Cyril Wratten which lists, amongst other subjects, every ringer who rang a peal and every tower mentioned in ringing performances in the journal. 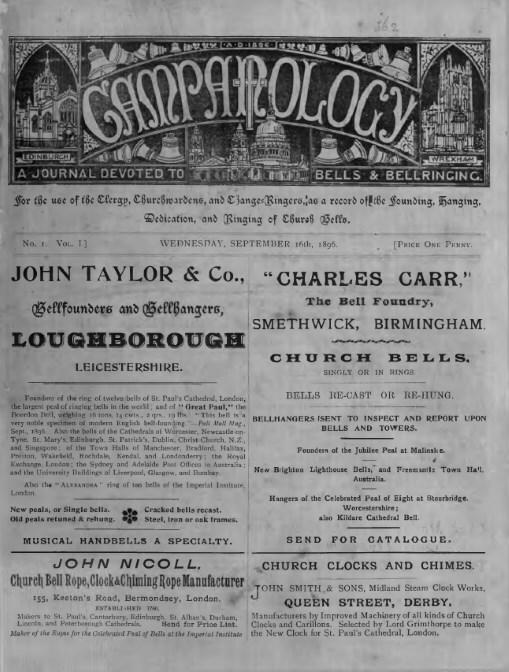 Campanology is also available on CD in one searchable pdf file. As with Campanology, the Library is grateful for the permission to use the index compiled by the late Cyril Wratten. The Bellringer is also available on CD in one searchable pdf file. 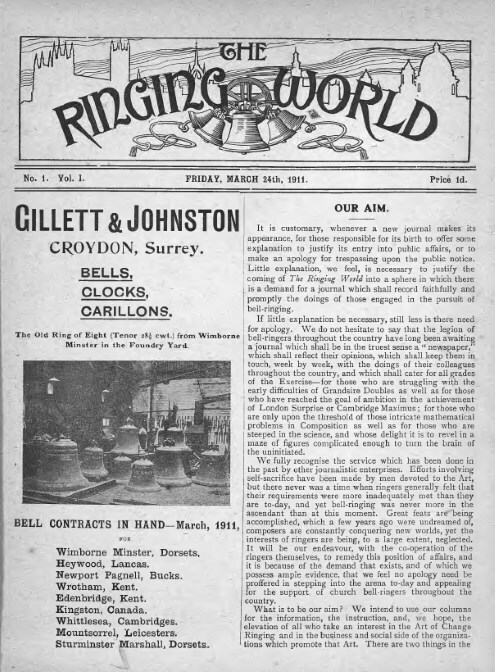 The Ringing World appeared weekly from 24 March 1911. Issues from 1911 to 1970 can be accessed below. Note that when using the index, which uses ‘Year/Page No’ references, some references in years 1912 to 1916 can occur in two volumes. The Ringing World (1911-1970) is also available on DVD on application. J A Trollope's unpublished history of ringing in London in the 17th and 18th centuries. Written between 1933 and 1939, the 7000 handwritten pages also contain sections on the development of bell fittings, early change ringing, composition, ringing in the provinces and published works on bells and ringing. There are many fine line drawings by the author. These are large pdf files and, without fast broadband, might be slow to download. However, once download they can be used for personal use. Being a manuscript it is not text searchable, but the contents and index pages within the document and the comprehensive bookmarking (thanks to Alan Glover) are useful. This 412 page manuscript was produced by J A Trollope in 1922 with an introduction by Rev E S Powell. In his Bibliographia Campanarum (1935) he describes the work as ‘an explanation of the abstract cyclical movement which is the fundamental principle on which change-ringing is based’. Essays on bibliographical subjects are issued to the Friends annually, together with a newsletter. The essays listed below, all by Dr John Eisel unless otherwise stated, can be viewed online. For the first time the career of John Alfred Parnell is considered in detail, together with his writings, and his inaccurate contributions to the history of change ringing. Discusses the part this nineteenth century clergyman played in the Belfry Reform movement and in ringing in Cambridge and Hertfordshire. A look into the activities of the club, it’s founder, William Laughton, and the comments of later historians.